This entry was posted in News I Find Interesting and tagged Football, nfl, playoffs, redskins got robbed. Bookmark the permalink. it’s not “likely” they would have missed the playoffs at all, since they made it by 2 games, it’s actually unlikely. They won vs. 49ers to clinch, and then won again in the last game of the season, giving them a 2 game margin. Since they still have to play on the road through the playoffs, the bad call to end the game vs the packers had no impact on their playoff chances. 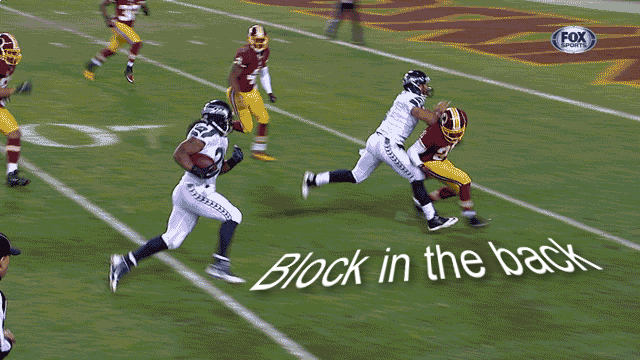 Also the reason the ‘illegal’ block wasn’t called is because the Redskins player turned his back to the blocker at the last second. Refs don’t call that. The 2-game lead wasn’t my point on not making the playoff. A loss to the Packers would have had a ripple effect across the NFC. In other words, it wouldn’t have just effected Seattle. It would have changed the complexity of the playoff hunt for the entire conference. Games are approached differently by every team. It’s possible Seattle would have still made the playoffs, but different games would have had playoff implications over the course of the season, again not just for the Seahawks but for the entire NFC. And I disagree that the defender turned his back. It was a no-call, but bad-calls and no-calls are part of the game. It’s not the reason the Redskins lost.